Book Review Once a Year By Axel Hoedt Reviewed by Sarah Bradley Axel Hoedt's Once a Year offers a series of photographs of traditional German festival costumes, a sort of project that has become more familiar with the recent work of Charles Freger, Estelle Hanania and Phyllis Galembo. Hoedt's work falls more inline with Hanania's approach, yet his take is his own. With a background as a fashion and portrait photographer, Hoedt's photographs revel in the strangeness of their subject matter. Once a Year. Photographs by Axel Hoedt. Steidl, 2013. Hardbound. 104 pp., 83 color illustrations, 7x8-3/4". Axel Hoedt's Once a Year offers a series of photographs of traditional German festival costumes, a sort of project that has become more familiar with the recent work of Charles Freger, Estelle Hanania and Phyllis Galembo. Hoedt's work falls more inline with Hanania's approach, yet his take is his own. With a background as a fashion and portrait photographer, Hoedt's photographs revel in the strangeness of their subject matter. A good fashion photographer isn't simply looking for beauty, but the moment where clothing transfigures the person wearing it -- a transformation perhaps never more powerful than with costume. Photographed against white backdrops or in the streets in both black and white and color, Hoedt's atmospheric images invite you to look, yet not in the same way documentary images do. In these images it is possible to see something beyond the garment. Momentarily still, Hoedt's photographs allow us flashes of a centuries old world hidden in the experience of otherness of this once a year tradition. 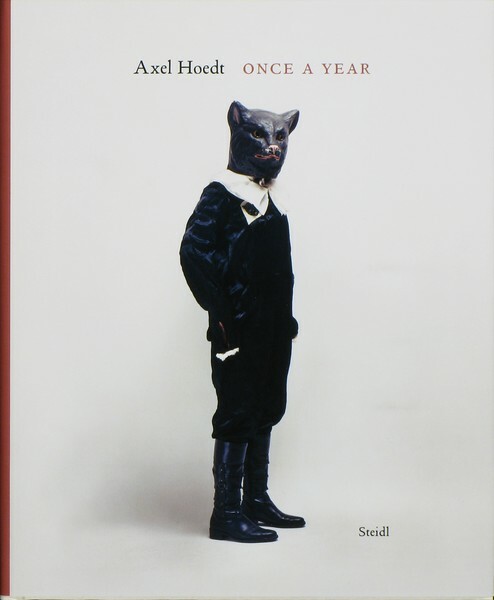 Once a Year, by Axel Hoedt. Published by Steidl, 2013. The description from Steidl indicates that Hoedts images aren't typical depictions of these characters. These are not rowdy festival photographs, but portraits, not simply of the costumes but the physicality and robustness of the characters. Wooden-masked individuals in motley suits, foxes, storks and straw-covered bears fill the pages, their presence interrupted by occasional images of an empty village street or forest with heavy grey sky. Though some are recent constructions, the age of the characters are soaked into every fiber of the costumes. These characters exist as a manifestation of the place that birthed them and the people who have paid homage by playing these roles across centuries. Static but living, the human form is continually present, but always just a bit remote. A mesh mask may give a glimpse at the face behind it, but the person never fully emerges. They are embodiments of a liminal state between the human beneath the garment and the character they realize, creatures of deep imagination. Hoedt as photographer and participant is never very far. The edges of his studio set up creep into a number of the photographs, bits of the floor and camera stands appearing here and there. Elements that may first read as sloppiness ultimately ground the series by placing the subjects in context, affirming their oddness by acknowledging the studio in which they stand. The photographs are imbued with a sense of gentleness, as if Hoedt approached his subjects with both reverence and a bit of caution, careful not to disturb the fleeting world he was capturing.